Developing countries that have made commendable strides in using formal education to avail equal opportunities to men and women still have a lot of work to move beyond white collar opportunities. While scores of women are now occupying managerial positions that used to be monopolized by men, a formula is yet to be found for extending opportunities to women in low income jobs that are mostly labor-intensive. For instance, agricultural technology has remained gender blind to the disadvantage of women who do most of the labor-intensive duties. However, the informal sector has done its part in generating women-friendly technologies and tools such as small scale peanut butter machines, soap making machines and machines for producing French fries for sale and household consumption. Although these machines and tools are still being improved, the informal equipment fabrication industry has revealed the extent to which mechanization and industrialization initiatives in most developing countries have ignored the needs of low income women and men whose economic contributions are in the form of manual labor. The majority of people at the Bottom of the Pyramid try to eke a living from agriculture. Unfortunately, national mechanization strategies have not developed close substitutes to the ox-drawn plough and the hand hoe which remain symbols of smallholder agriculture. In many households, men continue to use the plough for planting while women use the hoe to weed and replant when germination is poor. There have not been meaningful efforts to develop technologies that can enable men and women to cross traditional gender roles in agriculture. With most men leaving for mining and other opportunities, agriculture is now a domain for women and women-headed households but equipment manufacturers have not responded to this critical socio-economic trend. Naturally, there are labor-intensive roles that can be fulfilled by men, for instance, on the agricultural production side. Traditionally, there were also roles defined for women, for instance, winnowing and weeding while men focused on ploughing. These roles were defined according to the physical nature of men and women. Technological development has not addressed the physical expressions and requirements of men and women in ways that enable crossing of physical barriers so that women can do duties that were previously male-dominated. 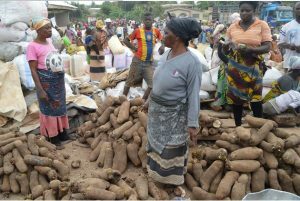 Some women roles have remained locked in specific agricultural value chains like groundnuts, small grains and indigenous poultry. Unfortunately, technological developments have not followed these value chains which give women a sense of ownership and decision-making power. For instance, the whole production, processing, preservation and marketing of small grains has not been improved from a technological perspective. Women continue to face the same traditional burdens yet wheat, which is also a small grain, has become highly mechanized because it is a male-dominated value chain. Where men become heavily involved, they end up exercising more power in decision-making because their input will be more than that of women. When mechanization and technology development initiatives support commodities like maize, wheat, sugar cane, tobacco and soya bean which need large land sizes, men end up controlling decision-making because they will be heavily involved. For instance, men can decide to buy machines like combine harvesters and sophisticated irrigation systems because they will be intuitively aware of what needs to be done in order to maximize production and productivity. In spite of women being originators of most food recipes, industrial technologies for adding value to agricultural commodities continue to marginalize women from the economy. As commodities go up the ladder, women recipes are hijacked by men who end up owning restaurants, food chain stores and beverage companies. As if that is not enough, development organizations and gender activists whose main mandate is improving the status of women have failed to commercialize feminine ideas. They just support women to exhibit their recipes and ideas at food fairs and agricultural shows where men poach the ideas and commercialize them. Women ideas are also limited in terms of finance where financial support to women still largely depend on approval from men (loan officers and husbands). Even if women own their own enterprises, once their husbands guarantee access to loans, the men end up controlling the business. It seems African countries have not done enough to enable women to independently make investment decisions without the approval of men and a whole male-dominated business culture. As if that is not enough, where technology is available, men tend to have better technology than women. For instance, the husband can have a smartphone while the wife has a lower class feature phone. That means if 90 percent of women have feature phones, they cannot access or share information that requires a smart phone. Modern rural industrialization should be about working with value chains within an ecosystem rather than transporting commodities from rural to cities and then export countries. Such a colonial model has continued to lock women at production level and restrict their participation in value addition yet they are the generators of recipes. Women cannot continue to be consumers of finished products processed outside when they could easily input their knowledge in the entire production and value addition process. Developing countries have to dumb the colonial value addition notion where agricultural commodities had to move from farming communities to districts, then to national levels and then exported to other countries. In the new fluid economy backed by data, commodities should move within Communities of Practice (CoPs) where different layers of value addition can easily happen. If women are empowered through technology, they can produce and modernize different products and pack diverse natural foods. Urban industrial technologies have caused some commodities and sources to lose their identity, with the final product being associated with manufacturers while the original producers become invisible. This can change if women are empowered with value addition technologies in rural areas where they stay. At the moment it remains difficult for most women to follow their groundnuts or small grains to the city where more benefits accrue to male-dominated manufacturing industries. Under the current industrial model, the price of value added products increases from urban to rural areas when it should be the other way round. For instance, potato crisps which can cost $1 in the city, cost $2.50 when they reach rural areas. Processing at source will reverse this pattern and ensure the price of finished commodities increase as they leave rural areas for cities and export markets. How can technology tap into women’s intangible knowledge? When society insists on knowledge being expressed through tangible assets like machines, it limits the expression of intangible knowledge which is mostly intrinsic in women. Male knowledge is more visible and tangible while feminine knowledge is more intangible and informed by intuitive wisdom. Intangible knowledge explains why women have powerful copying strategies. While men may be thinking about food in its physical form, women will be thinking about how to quieten a hungry child. In countries where social safety nets are absent or weak, social issues move from national to household levels where women are in the forefront of coming up with copying strategies using their intangible knowledge. The promotion of Science Technology, Engineering and Mathematics (STEM) in many developing countries is a very noble idea. However, to what extent will STEM address gender imbalances? Are there roots showing how STEM is going to assist ordinary women in the street and marginal communities? To what extent can STEM be informed by Indigenous Knowledge Systems in developing countries? If not grounded in the needs of the majority, STEM will only go back to assist formal industries and reinforce the prevailing socio-economic injustices. Rural women will continue to process small grains using pestle and mortar while men own and control processing companies. This entry was posted in agri-bussiness, Agricultural Intelligence, Agricultural Markets, eMKambo, health and agriculture, zimbabwe agriculture and tagged zimbabwe agriculture. Bookmark the permalink.